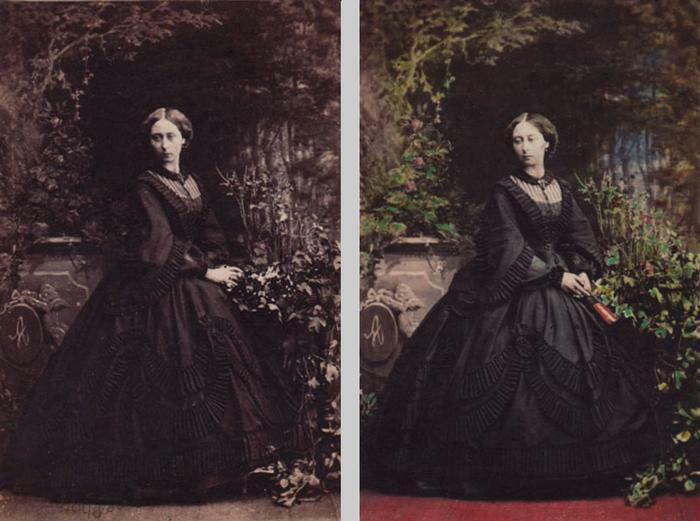 These portraits are from a series made during a sitting which the Princess gave Silvy on 4 July 1861, the day after her father the Prince Consort visited the studio. Silvy's daybook for this period contains three portraits of the Princess taken on this date, each with a completely different set and properties, and an album in the Royal Collection contains ten of the resulting portraits. The Princess is wearing mourning for her grandmother, the Duchess of Kent, who had died four months earlier. Princess Alice was the third child and second daughter of Queen Victoria and Prince Albert. In July 1862, a few months after the death of her father, she married Louis IV, Grand Duke of Hesse-Darmstadt. The bride wore a black trousseau and the marriage, the Queen herself said, was more like a funeral than a wedding. Though Lord Clarendon considered him 'a dull boy from a dull family in a dull country,' and the Duchess of Cambridge thought it 'an insignificant match,' Alice was delighted with her partner. She died of diphtheria at the age of thirty-five on 14 December 1878, the seventeenth anniversary of her father's death, a loss which occasioned a letter from her mother to her older sister of thirty-nine pages.